Home / Women In Islam / 7 conditions for a Woman's dress in Islam. 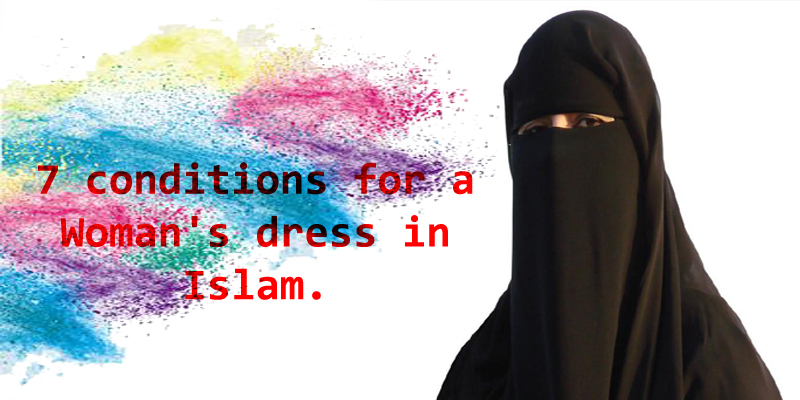 7 conditions for a Woman's dress in Islam. 1. Clothing must cover the entire body, only the hands and face may remain visible. 2. The material must not be so thin that one can see through it. 3. The clothing must hang loose so that the shape / form of the body is not apparent. 4. The female clothing must not resemble the man's clothing. 5. The design of the clothing must not resemble the clothing of the non believing women. 6. The design must not consist of bold designs which attract attention. 7. Clothing should not be worn for the sole purpose of gaining reputation or increasing one's status in society. The reason for this strictness is so that the woman is protected from the lustful gaze of men. She should not attract attention to herself in any way. It is permissible for a man to catch the eye of a woman , however it is haram (unlawful) for a man to look twice as this encourages lustful thoughts. Islam protects the woman, it is for this reason that Allah gave these laws. In today's society womankind is being exploited, female sexuality is being openly used in advertising, mainly to attract the desires of men and therefore sell the product. Is the woman really free in today's society ? The answer is obviously no, the constant bombardment by the media as to how the ideal woman should look and dress testifies to this. Islam liberated woman over 1400 years ago. Is it better to dress according to man or God ? 24.31 Say to the believing women that they should lower their gaze and guard their modesty ; that they should not display their beauty and ornaments except what must ordinarily appear thereof. 24.30 Say to the believing man that they should lower their gaze and guard their modesty ; that will make for greater purity for them, and God is well aquatinted with all they do. 24.31 And O ye believers turn ye all together toward God, so that ye may attain bliss.